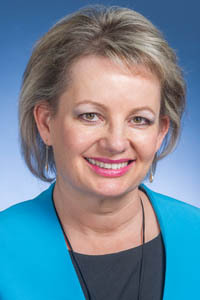 Born in Nigeria to British parents, Sussan Ley spent her early childhood in the United Arab Emirates, before migrating to Australia at the age of 13. Schooled in the UK, QLD and ACT, Sussan gained her commercial pilot’s licence at just 19 and had a varied career before starting university when her first child turned one. Sussan spent the next 10 years studying part-time on the way to three children and three finance degrees, including a Master of Accountancy from CSU, and sought Liberal Party pre-selection for the Federal seat of Farrer in 2001. Named the second female cabinet member of the Abbott Government in December 2014, Sussan is now Minister for Health and Sport. Here she explains why regional universities like CSU are so important for rural women. My mum was a trained nurse and my dad worked for British Intelligence... Neither went to university and neither did I till I was 30. At school... I was teased about my English accent, became a punk rock chick (at a time when it really mattered) and dreamed of a career as a pilot. My childhood was... interesting and slightly exotic; I grew up in the United Arab Emirates. As a child, I was most curious about... the skies and flying and the people who lived in the palm shacks in the desert. I chose CSU... because it was close to where I lived and had a great reputation. At university I was inspired by... all those students who spent so much more time than I did on assignments. Today I’m motivated... to bring the voices of rural, regional and remote Australians to people who live in our cities. I’m passionate about what I do because it matters to peoples’ lives and to the country’s future. In my profession it is important to... be incredibly persistent but also not to take yourself too seriously. I never dreamed I would... represent the Snowy Mountains Scheme after drawing it on a map in my English boarding school. The biggest influence in my life... has been Australia, a country I wasn’t born in and which I did not used to be a citizen of, but which I feel immensely privileged to belong to. I’m most proud of... my three children. My greatest achievement... was to gain a commercial pilot’s licence at 19, be elected to the Federal parliament and to make it this far in life without running off the rails. In the future... I’d like to go into an ashram to meditate on the meaning of life. The topic I Tweet about most is... the people I meet and the places I go. The best piece of advice I ever received was... “You can achieve a lot if you don’t care who takes the credit for it”. The single-most important issue in the world is... Peace, Love and Understanding. One last thing... without strong regional universities like CSU so many women from rural Australia would not achieve their potential. I know – I am one of them.